Give your medical personnel, board, administration or anyone interested in the hospital’s cause the app on the frontline of donor acquisition! accent puts you in the middle of the moment. We are a branding and marketing company that is at the forefront of research and technology. We use cutting-edge, creative approaches to find solutions to whatever you need, including expanding your circle of philanthropy. accent’s frontline philanthropist app gives your frontline staff of hospital caregivers the tool to make that spontaneous wish an immediate reality. Patients and family members who have had amazing care and life-saving treatments want to give back. All they need is the “how.” The frontline philanthropist app turns words into actions by instantaneously connecting those who want to give to your development office. One tap downloads the app to a smartphone, tablet, laptop — any device that connects to the Internet — whether it is an Android or Apple. Our app also integrates into hospital intranet systems. The app is fast, reliable and user-friendly with the power to text blast reminders to your frontline staff to keep them engaged. The app keeps things moving because staff time is short and the time to make patients and family members’ altruistic dreams come true is even shorter. Anyone committed to your cause — from board members to administrators to volunteers to so many more — is truly on the frontline of donor acquisition. 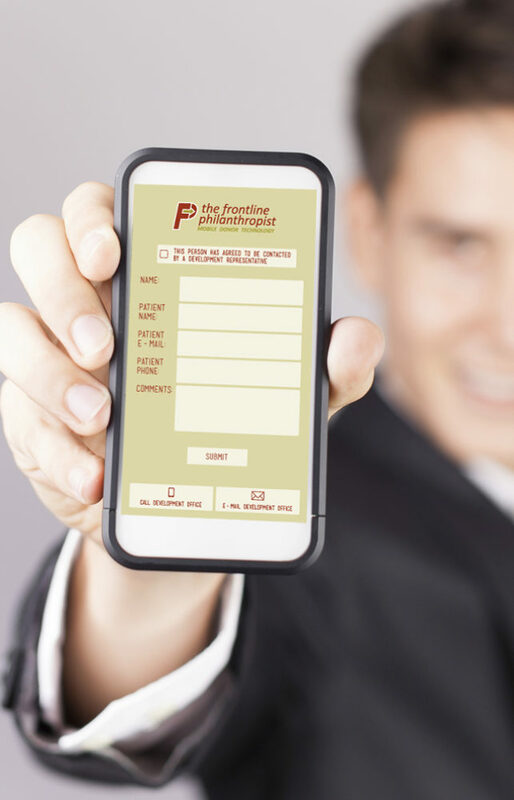 The frontline philanthropist app turns every encounter and every cue into an opportunity to easily guide new prospects to your advancement office. The St. Mary Foundation became the first to launch the app, branding it to their specifications. By tailoring it to their needs, the St. Mary Foundation included an extensive physician education program, with accent-designed collateral marketing materials; a physician champion network; and extensive programs to engage their medical staff. The end-user sees a user-friendly app. You see a powerful database that works behind the scenes to give you instant access to new donor prospects that are “pushed” to your mobile device. And it is available anytime, anywhere through a secure, online format on your computer. accent’s proprietary coding allows for full HIPPA requirements. We work with your compliance office to meet your needs. We provide custom coding to meet any variant to better target your user or institution. The Frontline Philanthropist® and Frontline Donor® are registered trademarks of accent communications, inc.